This activity incorporates fraction and decimal operations (comparing, ordering, rounding, adding, subtracting, multiplying, and dividing) story problems. 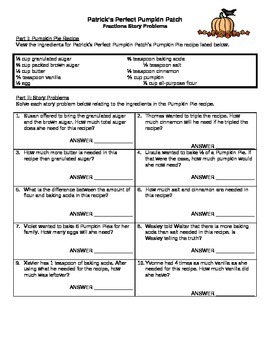 Worksheet 1 - Pumpkin Pie recipe as the focus. Students will use critical thinking skills to solve each fraction problem. 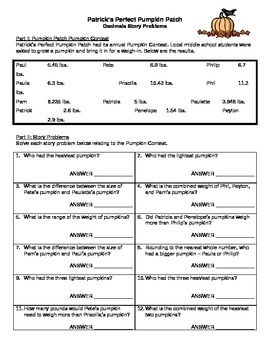 Worksheet 2 - Pumpkin Contest (weight) as the focus. Students will use critical thinking skills to solve each decimal problem. 1. Susan offered to bring the granulated sugar and the brown sugar. How much total sugar does she need for this recipe? 2. Yvonne had 4 times as much vanilla as she needed for this recipe. How much vanilla did she have? 3. What is the difference between the size of Pam’s pumpkin and Paul’s pumpkin? 4. How many pounds would Pete’s pumpkin need to weigh more than Priscilla’s pumpkin? These items are completely editable so that you can add the names of your own students or add additional directions. These items are both inclulded in the Fall Theme Middle School Mathematics Mini Bundle. If you purchased the bundle, you do not need to purchase this item.